As a kid, you admired those serious Working Men who seemed to be able to fix or drive anything. They got to wear jeans to work every day and never cringed even when cars raced by too close on the side of the road. Now that you're one of those tough guys, you know ... (see full details) (see specifications) #OCCLUX-TJR-YEL. As a kid, you admired those serious Working Men who seemed to be able to fix or drive anything. They got to wear jeans to work every day and never cringed even when cars raced by too close on the side of the road. Now that you're one of those tough guys, you know the secret to keeping cool when work gets dangerous. It's not that you've got nerves of steel, you've got hi-vis clothing. Even when the weather gets messy, you stay safe in an Occunomix Hi-Vis Yellow Premium Waterproof Breathable Jacket LUX TJR YEL. Since it has an ANSI/ISEA 107-2015 Class 3 safety rating, you know this jacket provides the highest level of visibility available for Working Men. Starting with a field of hi-vis yellow, this rain jacket has two-inch wide 3M Scotchlite reflective material to make it even safer. Two 360-degree horizontal stripes encircle you--one at the chest and one at the bottom of the jacket. In addition this workwear is also equipped with two more bands of reflective tape that encircle each of your arms at the wrist and the bicep area. This Occunomix waterproof jacket's constructed of 100% ANSI polyester with a polyurethane coating. The fabric is breathable, and the coating ensures that the jacket is waterproof. Sealed seams give you the extra security of knowing that water won't even get in at the areas that take the most stress. A zipper covered by a snap placket blocks water at the jacket's closing point. Including features like a detachable, roll-away hood and two outside pockets, this simple coat provides utility without bulk. It's the perfect choice for days when you don't need a lot of insulation, but you do need to be prepared for inclement weather. When it's raining, foggy, or snowing, you really need to ensure that you're visible on the job site. This Occunomix Hi-Vis Yellow Premium Waterproof Breathable Jacket LUX TJR YEL has an ANSI Class 3 rating, so you know it's made for the worst conditions you can encounter and still work. Add this rain jacket to your collection of rain gear today, stay safe, stay dry -- you won't be disappointed with this Occunomix hi-vis rain coat. I have had to use this rain coat 2 times now. It is very good as far as wind resistant, rain proof?.... another story. For one is too short and my lower back and rear get very wet. And having just been out in very heavy rain it is not very rain proof as I am soaked to the bone. Going to order Carhart rain gear and give it a try. SORRY TO READ IT DIDNT KEEPTHE REVIEWER DRY, BECAUSE MY HUSBAND DOESNT HAVE THAT PROBLEM AT ALL WITH HIS AS WELL AS THE LENGTH NOT BEING A PROBLEM, HE'S 6 FT 2 AND HAS A VERY PHYSICAL 10 HOUR DAY LONG JOB. WE GOT THE PANTS AS WELL AND THEY HAVE BEEN GREAT, ALSO THE NEW SPEED GEAR INSULATED HIGH VIS. BIBS, FOR COLD WET WINTER AND HE IS VERY PLEASED WITH THEM AS WELL. 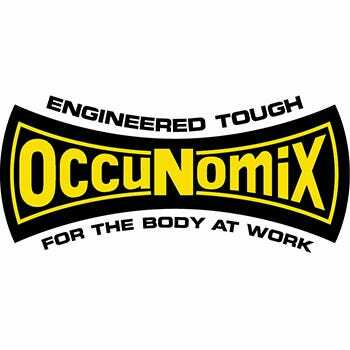 OCCUNOMIX IS PROOVING TO BE A VERY RELIABLE BRAND FOR US, THE QUALITY OF THE COATIS EVERYTHING IT STATED IT WAS TO BE, OVERALL MY HUSBAND LOVES THE FREEDOM AND MOBILITY THAT HE HAS WITH THIS BRAND, THERES NO BULK AT ALL IN ANY OF HIS OUTTERWEAR AND BETTER YET ITS NOT HEAVY WHEN WET OR DRY , THEIR TECHNOLOGY IN THOSE BIBS IS AMAZING AND THIS WINTER WAS A TRUE TEST. This the first experience with Occunomix. Very happy with the bright visibility color. The lightweight material does not restrict movement. The elastic at the wrists is a good feature that keeps rain from running down your arm while working overhead. An addition of an inside pocket would be very useful. Love it. I'm in and out of my van making deliveries. This jacket is lightweight and not bulky. The sleeves prevent any of the elements from coming in. The colors are visible for my safety. This is a definite purchase for anyone is constantly in and out of their vehicle. This is highly recommendable. Great product. Occunomix Jackets: Men's Hi Vis Waterproof Breathable Rain Jacket LUX TJR YEL is being added to your cart.